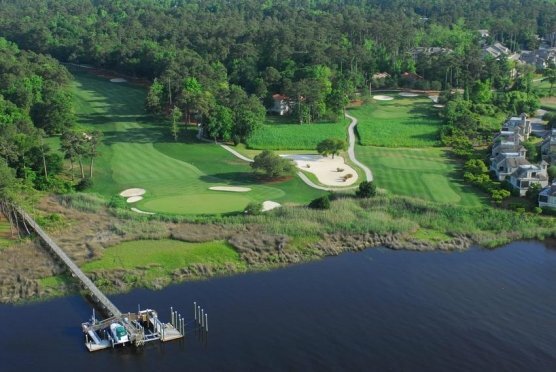 SUNSET BEACH, NC – For more than 25-years Oyster Bay Golf Links has received an almost endless number of accolades and awards beginning in 1983 by being voted Golf Digest “Resort Course of the Year.” This Par 70 Dan Maples gem continues to shine with both critics and players alike. Oyster Bay has a uniquely pleasant blend of natural beauty and playability. Saltwater marshes, freshwater lakes, natural waste areas and pine forests provide an almost breathtaking setting. That’s just the beginning of what makes this golf course great. The way the architect utilized this wonderful piece of property is what makes Oyster Bay so very special. Although the course is fair the lakes and marshes along with some cavernous bunkers do come into play. This true test of golf requires a strategic approach to the game. However, regardless of the tees that fit your game undulating greens await you. Oyster Bay in late January is both strikingly beautiful and in superb condition. From tee to green the course was in great shape. The practice range is indicative of the fairways lies you’ll experience. The practice green is the equivalent of its on course partners. Do allow time to visit the well-stocked pro shop. Both my grandson and our playing partners from New Jersey, a father and daughter, agreed that the 5 Par 3s were marvelous and defined the course. Although water really isn’t a factor on the front nine, well-placed and challenging sand hazards can be penal. On the back nine Nos. 15 and 17 are surrounded on three sides by water that awaits the wayward shot. Each of the Par 3s is quite challenging. No. 8 requires a shot over marsh to a hole protected by a trap on the left front. Play to the right of the pin into a right to left sloping green. Lengthy Par 4s (averaging 398 yards from the Blues!) many with elevated greens will really test your game. Unless you’re exceptionally long the average mid-handicap golfer will need to lay-up allowing a short iron into the green. For my length there are only three/four holes from the Blues I could hit in regulation. No. 2 is the #1 handicap hole and a truly great hole. From the Blue Tees a 160-yard carry over the lake is necessary. Three sand bunkers line the right side of the fairway of this uphill hole. A back pin position on a large green protected front right and back left by hazards is exceptionally challenging. Scoring a bogey is quite acceptable and par is outstanding. Each of the 3 Par 5s has some length from the Blue Tees, but a birdie is not out of the question for the solid short iron player. No. 9 requires an accurate drive to the center of the fairway, which has sand hazards guarding both sides of the landing area. Marsh on the left parallels the fairway almost to the green. Your second shot requires a fairway wood or long iron, again to the center of the fairway. Sand hazards guard both sides of the landing area. A short iron to the center of the green puts you in great position for a birdie. Some regular readers of my golf course reviews tell me that they always know if I really liked a golf course. Well just in case I haven’t made it clear, I in truth rank Oyster Bay Golf Links one of the top courses on my “Must Play” list. I believe you’re really going to like it, also.